Onebridge works hard every year to create a great working environment for its employees and the results are showing. Onebridge's label, as one of the Best Places to Work in Indiana, is an accomplishment each employee proudly stands by. 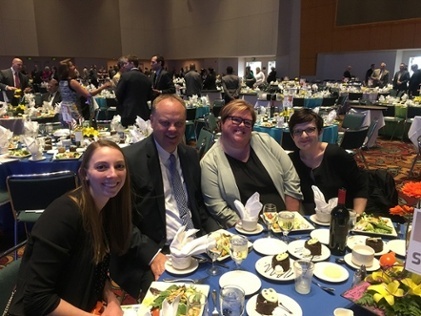 When Onebridge first made the top 100 list years ago as SmartIT, we set out on a mission to become THE Best Place to Work company in the large category in Indiana. Our COO and Co-Founder, Paul Rothwell remembers when the company was first starting out, the strong culture that was being built and how easy it was to be engaged with each employee: “We had a good culture that we wanted to keep.” As the company grew to over 40 Million, Paul and Karen Cooper, the CEO and Co-Founder, had to make it a priority to continue to have a great culture. So, how does Onebridge get the right people and keep them around? Well, we’ve shifted our focus and have integrated more processes and structure into our culture to guarantee that as the company grows and change occurs, the culture improves as well. 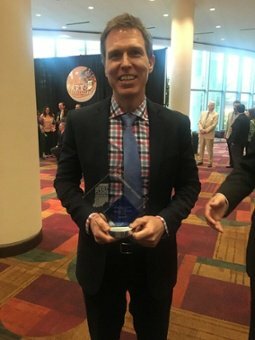 2017's Best Places to Work in Indiana event housed 100 companies and their supporting casts in the Indiana Convention Center’s Sagamore Ballroom for a night of drinks, food, networking, dancing (at times awkward but still entertaining), and awards. Coming in at #15 in 2016, we had high hopes of moving up in the rankings this year. Switching between small, medium and large companies, the announcers began going down their lists to award each company its ranking. Employees of those companies would then walk down the center aisle, dancing and cheering for their organization’s success. As they announced numbers 20 through 15 in the large company category and the team still had not heard our company name, we couldn’t contain our excitement! They call number 10 and it’s still not Onebridge. Smiles begin to roll across each employee’s face; each knowing that we are now somewhere in the top nine and no matter what place we take, we’ve already exceeded our expectations. When they finally announced us in 7th place we all stood up in excitement and began to congratulate one another. Brad Bruno, our BI Solutions Architect, took it upon himself to lead the group in dancing down the center of the aisle to accept the award. The rest of us followed behind him, some dancing, and some running and laughing! We finished the night off in a fit of excitement with cake and laughter ready to come back to the office with our new award and the satisfaction of a job well done. So, what’s next? Grabbing a beer and some popcorn from the break room and getting back to work so next year is an even better success. Congratulations to each one of our co-workers for their hard work and dedication in making the company better each day!